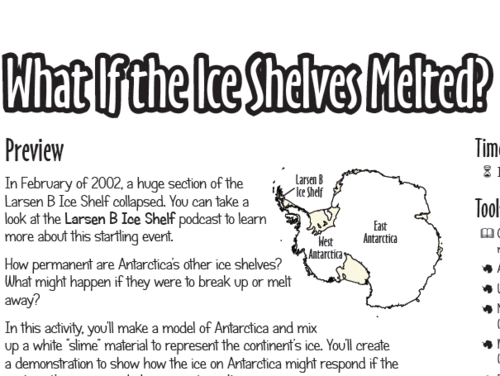 What if the Ice Shelves Melted? This activity is a hands-on guided inquiry activity designed to highlight the role of an ice shelf on slowing the movement of continental ice sheets in Antarctica. Students build a model of Antarctica and both continental glaciers and ice shelves using paper models of the land and slime for glaciers and ice. Students use their model to explore the impact of recent and potential ice shelf melting and break-up. Consider doing [link http://cleanet.org/resources/42698.html 'Activity 5A - Charting Temperature Changes'] before this activity and [link http://cleanet.org/resources/42700.html 'Activity 5C - How does Melting Ice Affect Sea Level?'] afterwards. Could be done as a demo or by pairs/small groups of students. Materials are messy and guaranteed to provoke laughter, so supervision is important. The model is simple but the results are dramatic. Comment from expert scientist: The activity provides a way to see the impact of the ice shelves on ice flow on the continent. The illustrated directions for students are exceptionally well done and each step is accompanied by excellent images to guide students. An excellent use of models to illustrate how scientists determine past climate history. Students present results to visitors in a kind of science exhibit/presentation format. Learning objectives are listed in Leader Notes. Lovely, squishy slime simulates ice. The teacher guide, leader notes in this case, for all the Andrill activities is housed at a separate site: http://www.andrill.org/flexhibit/flexhibit/materials/activities/Leader_N.... Teacher materials a little on the sketchy side. Students should have no problem following their clear and well-written directions.